Botswana Wild Parks BTa13. Botswana is considered Southern Africa’s premier game viewing destination. But it is also known as a very expensive destination. However by using a range of affordable lodges Sunway offers a fully accommodated tour of Botswana at a value for money price. During the safari you will travel in a purpose built 4WD Land Cruiser with 12 forward facing seats and a trailer for luggage when visiting the Moremi game reserve. For the rest of the tour you will travel in our custom built safari trucks or Mercedes Benz sprinter and trailer both with 12 forward facing seats. Included in this tour are 12 breakfasts, 9 lunches and 5 dinners are included. Where meals are not included there will be an opportunity to buy a meal on route or at a local restaurant in the evening. Day 1: You will join up with your group at the lodge in Maun at +-17:00pm. Since Maun’s founding in 1915 as the capital of the Batswana people it has had the reputation as a hard-living “Wild West” town helping the cattle farmers and tourism operations. The name Maun derives from the San word ”Maung” which translates to ‘the place of short reeds’. Day 2 – 3: We drive into the Okavango Delta to the launch station where we board our mokoro’s and pole to our tented camp in the heart of the largest inland delta in the world. This amazing environment has large numbers of red lechwe, buffalo, elephant and birds, particularly kingfishers! One of the best experiences in the Okavango Delta is to be poled along reed-lined channels in a mokoro (dug-out canoe). Sit back and relax as the water gurgles gently under the mokoro while your skilled poler points out the fauna and flora. 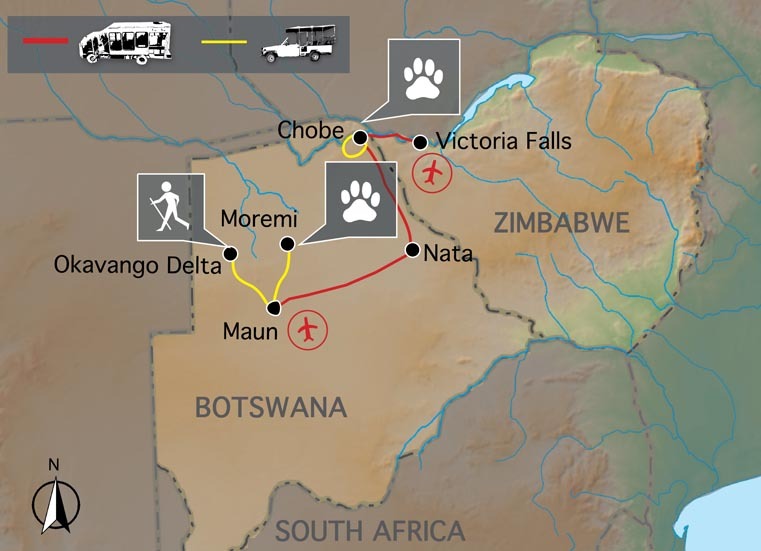 Day 4 – 7: We take an open 4WD into Moremi Game Reserve for fantastic game viewing! Chief’s Island is the largest landmass within Moremi and was the Batswana tribe’s richest hunting ground, before being declared a game reserve by the tribe. We spend 4 days on game drives watching the abundant wildlife including elephant, hippo, buffalo, lion & other game, both in Moremi Game Reserve and in private concession reserves surrounding the park. We return to Maun midday on day 8 for an evening restaurant meal (own expense). Day 8: We have time for an optional game flight over the Okavango before we head to Nata (own expense). The shimmering saltpans of Makgadikgadi appear as a glaring white, endless plain. When the rain comes a dramatic change takes place as thousands of wildebeest and zebra migrate to the sweet nutritious grasslands and clouds of flamingo feed in its algae rich waters. It is an area of low rainfall so this spectacle only lasts a short while. Day 9 – 10: The Chobe River is a stunning feature of Botswana and will be the focus of our lodge stay. The Chobe River flows lazily along the northern boundary of the Chobe National Park attracting some of the largest herds of elephant in Africa. An Early morning 4WD game drive in the Chobe National Park and an afternoon game viewing “sundowner” cruise to see the mighty elephant herds return to the Chobe River to quench their thirst. Day 11 – 12: We visit “Mosi oa Tunya” or “the smoke that thunders” – Victoria Falls. These magnificent falls are one of the seven natural wonders of the world. The Victoria Falls Bridge was commissioned by Cecil John Rhodes in 1900, and was completed by 1905, although Rhodes never lived to see it. It spans the impressive gorge and the famous adrenalin pumping Victoria Falls bungi jump is done from this bridge, with a terrifying drop of 360ft (111m). Opportunities to white water raft on the mighty Zambezi River, bungi jump, or take a “flight of angels” (own expense). Day 13: Tour ends after breakfast at 08:00am. A true African experience – wild and free! All inclusive trip with cultural experience, adventure and wildlife. The Okavango Delta, Moremi Game Reserve, Makgadikgadi Pans, Chobe National Park & Victoria Falls.